Age: Over the hill, but still trying to be a teenager. Family: Wife Sue, two sons, Michael, and Stephen. Medical Research Council, Cambridge, UK. 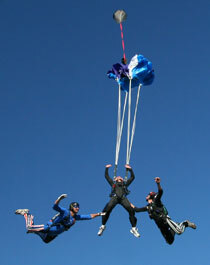 Accelerated free fall level 1 @ 12,000 ft - more fun than words can describe ! If jumping out of a perfectly good plane isn't for you then how about off a bridge ? 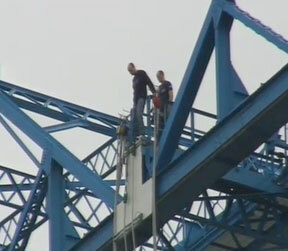 This is the Middlesborough Transporter Bridge and is 160 feet from the jump platform to the water. My wife got this jump for me as a birthday present (she wants the insurance). 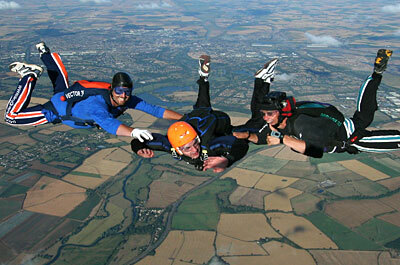 It didn't last as long as the skydive but probably more of a rush as you are so near the ground. Quicktime movie of the bungee jump here.